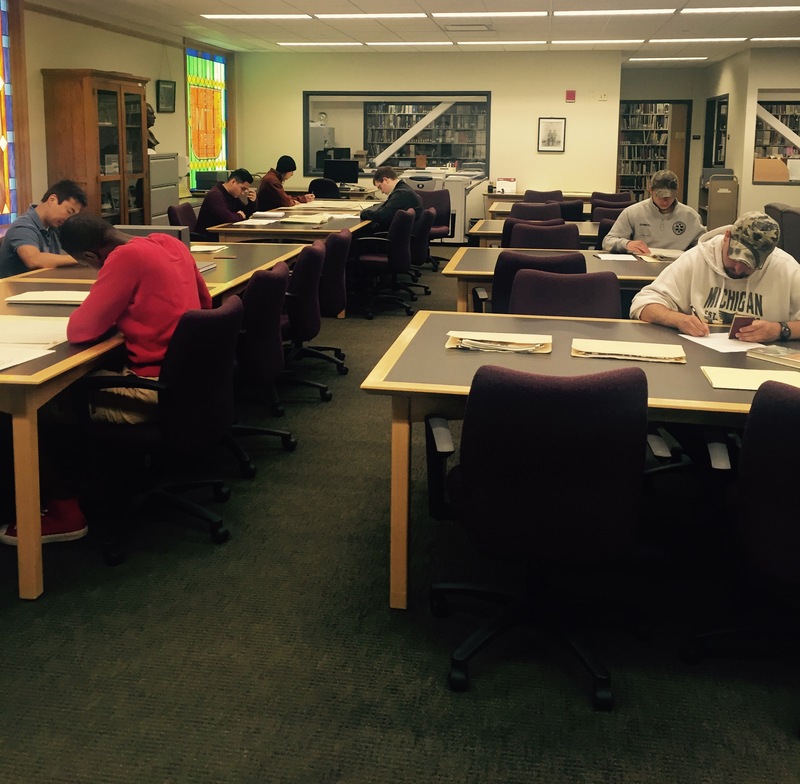 Students from SS 3540, History of Michigan, conducting research during a hands-on research workshop on June 2, 2016. In addition to preserving and providing access to a wide variety of historic print, graphic and digital material, the staff of the Michigan Technological University Archives and Copper Country Historical Collections also offer research support services to meet the unique research needs of students, faculty, staff, and community members. Research support services within the Archives can be tailored to the specific needs of researchers, curricula, or one class. During the summer, our research orientations, tours and hands-on research workshops are particularly popular with undergraduate students and genealogical researchers. Research orientations and tours for small groups and class visits are designed to give participants an overview of policies, resources, and research methods. These sessions may appeal to faculty from many areas of the university to find ways to use, or promote the benefits of primary source materials in their courses. Research orientations and tours are designed for groups no larger than 20 participants and typically last 45-60 minutes; these are available to members of the university as well as to the community. The newest service that the Archives has initiated is a hands-on research workshop. These sessions are built around a specific course objective, assignment, or research project. Workshops involve an in-depth discussion about research as it pertains to a specific topic or material type. These sessions include a hands-on research activity and worksheet customized to give participants a deeper understanding of a specific aspect of archival research. Research workshops typically last 45-60 minutes and they are available to all faculty, staff and other research groups. In addition to these services, the department also offers research consultations for individual researchers. Please contact the Michigan Tech Archives at (906) 487-2505 or at copper@mtu.edu to learn more about how our research support services may benefit your archival research project. Interested in researching Copper Country history or tracing your family roots but are just to darn far away to visit the Michigan Tech Archives and Copper Country Historical Collections for yourself? 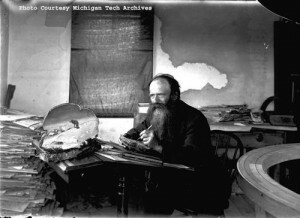 As a courtesy for those who aren’t able to visit the Upper Peninsula, the Michigan Tech Archives offers a list of independent researchers for you to contact. You can make arrangements with these individuals to undertake research for you, from looking up an obituary in a historic newspaper to gathering background information for a book and more. Will do look ups in the MTU Archives and marriage records in the courthouse. Also local cemeteries, photos, and information. Researching genealogy records for 32 years. Researching Houghton and Keweenaw County for over five years. Member of the Association of Professional Genealogists. These researchers are not affiliated with Michigan Technological University, and the Michigan Tech Archives has no control over the results of their work.